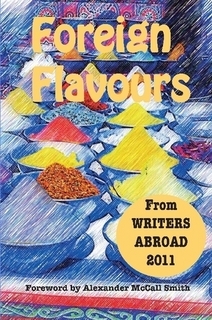 This week the virtual writers’ group, Writers Abroad, announced the publication of their second anthology Foreign Flavours, which contains 64 contributions, including 33 recipes, from ex-pat writers from around the world. If you’re not familiar with the group, Writers Abroad is an online writing group, founded in 2009, which provides a forum for ex-pat writers to exchange ideas, views and news on writing and to offer support and constructive feedback on each other’s work (Writersabroad.com). All proceeds from the sale of this book will go to The Book Bus, a charity whose aim is to bring literacy and the joy of reading to children in the developing world. And if that’s not enough for you, Alexander McCall Smith, acclaimed author of The No.1 Ladies’ Detective Agency Series, has written the preface. The book is available now for $14.83 here.